Maharashtra finish top with 228 medals in Khelo India Youth Games. The Khelo India Youth Games concluded in Pune yesterday with the hosts Maharashtra walking away with the overall trophy. They amassed 228 medals, comprising 85 gold, 62 silver and 81 bronze. Haryana, were second with 62 gold, 56 silver and 60 bronze for a total of 178 medals, while Delhi were third with 48 gold, 37 silver and 51 bronze for a total of 136 medals. 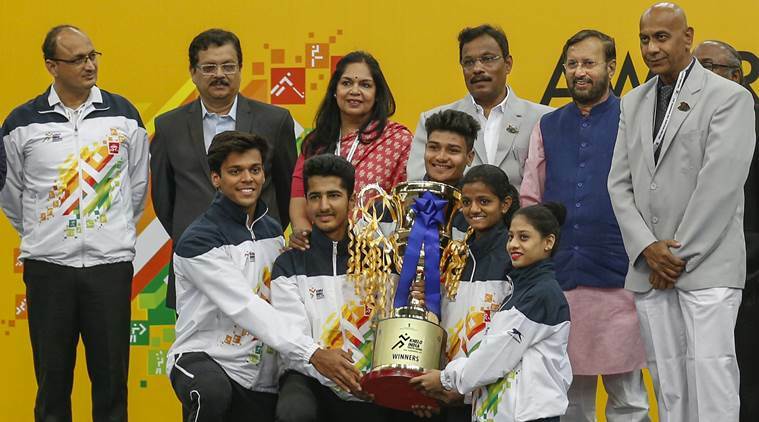 The glittering Trophy was presented to the Maharashtra sportspersons and officials by Union Minister for Human Resource Development, Prakash Javadekar, and Maharashtra's Minister of Sports and Youth Welfare, Vinod Tawde, at a closing ceremony held at the Shree Shiv Chhatrapati Sports Complex. Speaking at the ceremony, Javadekar said the performances of the athletes at the Games had underlined the Prime Minister’s idea of "5 minute aur" for sports. He added that the government was determined to bring in a compulsory one-hour daily period for sports in every school across the country. The idea was greeted with huge cheers and applause. Encouraging all sportspersons, Tawde said that he wanted not just five minutes, but 50 minutes. Earlier, Director General of Sports Authority of India, Neelam Kapur welcomed the dignitaries present on the occasion. In her vote of thanks, Kapur pointed out that it was the tremendous efforts of the Maharashtra Government and the hundreds of volunteers that had made the Games so successful. She said the Khelo India Youth Games 2019 had an approximate participation of 10,000 persons, including more than 5,925 athletes. She said this was almost double in comparison to the approximate 5,500 at the Games last year. Haryana asserted themselves in hockey, winning the girls Under-21 final to take their third gold in hockey from four finals, while Uttar Pradesh, West Bengal, Tamil Nadu and Kerala won gold each in volleyball.